On top of all this, 2017 was more astonishing because none of what happened involved or required men. There was no intervention by the male power structure to grant women just a little more equality. 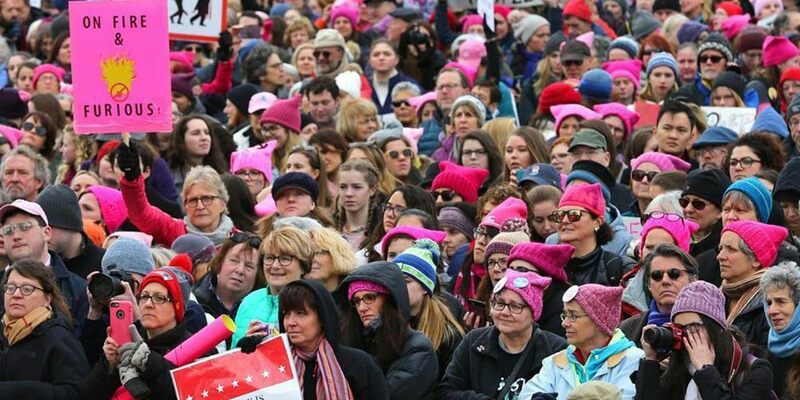 2017 saw women standing together, refusing to accept the status quo, and demanding change. With all this women-standing-up-and-demanding-equality going on, with all this progress finally happening, does being raised Catholic even matter anymore? Unfortunately, sadly, terribly, the answer is yes. Women who were raised Catholic were taught to believe that we are created for motherhood, and designed specifically for supporting and complementing men. We were taught that our purpose is to marry and reproduce (having as many children as God wants us to have, which is usually lots), and to take care of people. We were not taught to explore our identities, to discover who we are, and then to contribute to the world based on accepting and embracing our selves, whoever they may be. We were not taught that as human beings, it’s our job to find out who we are and then to be that person as we contribute to the world, whether that person is a mother or a soldier, a nurse or a civil engineer. We were also not taught that as individuals, we have the right to decide whether we want children or not, and if we do, how many children we will have. We are lucky to live at a time and place that presents us with role models who demonstrate autonomy, self-determination, strength and grit. More and more, we see women who have discovered, and who refuse to hide, who they are. These role models joyfully inhabit their true selves, no matter how far outside our society’s traditional norms (which come directly from the Catholic belief system and its Christian offshoots). Supreme court justices, welders, astronauts, CEOs, movie directors, construction workers – all used to be off-limits for women, and all have become acceptable. And while women are still woefully underrepresented in many non-traditional fields, we continue to break down barriers and claim equality, year by year. But how many of us have been, like these role models, able to discover and fully inhabit our true identities? And then, freed from our Catholic-imposed identity, to contribute to the world based on who we really are? How many of us don’t understand who we are, or have undertaken the journey to find out much later in life, after spending decades doing what we were taught we were supposed to do? We do, however, know that children are exquisitely sensitive to imposed beliefs about themselves. Study after study shows how stereotypes about what girls can and cannot do limit what girls believe about their abilities. And study after study shows that girls who believe they can’t do something don’t try. It’s safe to conclude that girls who are explicitly taught that God made them as companions for men, that it’s their destiny to replicate the Holy Family by marrying and having children, that it’s their holy duty to spend their lives taking care of those children, their husbands, and anyone else who needs taking care of, would find it more difficult to believe, to understand, that they have the right to explore and discover their unique identity. And while exposure to role models may mitigate some of our Catholic indoctrination, it cannot erase what we were taught about ourselves when we were children, and it cannot adjust the trajectory of our lives to eliminate the effects of being women raised Catholic. Can today’s girls who are being raised Catholic extract enough inspiration from all the female role models they see to counteract the messages they’re receiving through religion classes and through family culture? There’s no way to know, but surely it’s a better option to not expose them to Catholic indoctrination in the first place. For societies to prosper, according to the World Economic Forum, gender equality is required. “Equality between men and women in all aspects of life, from access to health and education to political power and earning potential, is fundamental to whether and how societies thrive.” (italics mine). Yet the Catholic church has historically opposed women’s rights, including the right to divorce and to have access to contraception. It continues to teach that a woman’s role, and identity, is mother. Not citizen, and not full human being. In the developed world, the number of Catholics is declining, but in Africa, Asia and South America, it’s growing. In these societies, more and more girls are being taught that birth control is a grave sin. They are being taught that their job is to complement men, not compete with them. Should they marry a man who beats them, they are taught, they cannot divorce him. If developing societies do manage progress toward equality for women, it will be in spite of the indoctrination their Catholic girls are receiving, not because of it. With 1.2 billion Catholics on the planet, there are approximately 600 million women and girls who were, or are being, indoctrinated with the Catholic belief system. On top of the personal and societal impacts, the global impact is enormous. In 1798, Thomas Malthus theorized that human population growth would be limited by the availability of food. When population outstripped food production, Malthus predicted, the result would be catastrophic famine that would shrink population back to sustainable levels. Since Malthus’s prediction, technological developments such as mechanized farming and chemical fertilizers have greatly increased food production and postponed a Malthusian crisis, allowing the human population to grow unchecked. But the cost of our ever-growing population has been staggering. Climate change, caused by the burning of coal and petroleum to sustain and transport more and more of the world’s 7.3 billion people, is causing a complete change in the ecology of our planet, resulting in water scarcity for 4 billion people; famine and mass migration, the greatest mass extinction of species (other than our own) since the disappearance of the dinosaurs, the acidification of the oceans, which has the potential to collapse food webs, biodiversity, and fisheries. an increase in wars and conflicts - the list goes on and on and on. It’s clear to any rational human being that the costs of continued population growth are catastrophic. Yet the Catholic church keeps on fighting against birth control not only in developed countries, where family sizes have fallen significantly, but also in developing countries, where women have far more children, and where the impacts of a too-large population are much more severe. It would be easy to assume that because of the women’s march, #MeToo, and everything else that happened during the past year, the hard work has been done and the Catholic belief system doesn’t matter that much anymore. But no matter the progress women make, being raised with the Catholic belief system has had a profound impact on our lives and the lives of so many women around the globe. What we accomplish, how we choose to spend our lives, how we feel about ourselves, all depends at least in part on how we were taught to think about ourselves and our purpose. Seeing role models in women who demand equality, who stand up to abusers, who choose their own paths, is helpful, but it cannot completely undo what was done to us. Beyond the personal level, the Catholic belief system has prevented, and continues to prevent, societies from successfully managing their problems. Without the complete participation of women – which Catholic indoctrination is specifically designed to inhibit – societal problems cannot be solved. And for the world, the existential crisis of climate change has been created at least in part by the historic inability of women to limit the number of children they have, and the Catholic church continues to teach women that controlling their fertility is a grave sin. Yes, unfortunately, being raised Catholic still matters. It matters for us, and it matters for the world.